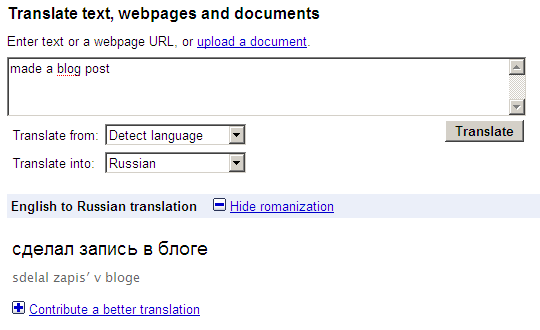 I had previously covered NiceTranslator that acts as faster and more convenient web interface to Google Translate. Since then Google’s service got updated interface, that makes many of same functions native. As before you type in word or phrase to get a translation. Major change is that translation will show on page right away, without need to press button and refresh. Aside from interface update there are some nifty functions like romanization option, which shows how to pronounce words. Phonetic accuracy may not be too accurate, but still good for quick info. When you use Translate for single word it now also shows results from Dictionary. Having multiply variations can make it much easier to understand word or put it in context. Downside is that Google’s translations are algorithmic. Where Translate gets you best match and makes sense (most of the time) Dictionary can give too many with large chunk of them being low quality matches. Improved interface makes a lot of sense and brings Translate closer to convenience of NiceTranslator. Inclusion of Dictionary results has mixed benefit. It can both clarify or throw off and I much prefer Wiktionary over it.